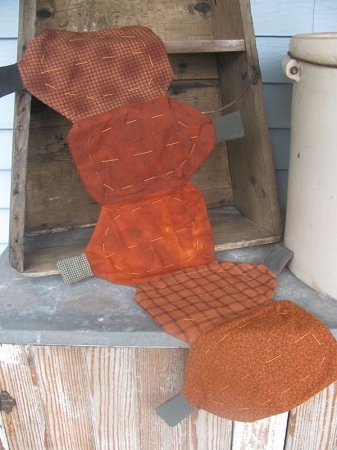 Primitive pumpkin runner made with fall homespun and flannels. Hand made by Lynn here at Gainers Creek. It is a beautiful fall pumpkin runner. Made from homespun flannel fabrics, no two are exactly the same. Machine washable. Size is 33 1/2" x 11". Made from a smoke free, pet free home. Wonderful addition to your fall decor for many years to come!